Over the years the adoption of Elasticsearch and its ecosystem of tools positioned them as the leaders in the time series data management and analysis market. With strong search capabilities, great analytical engine, Kibana as the flexible frontend and a number of data shippers enable building of end to end data processing pipeline using components designed to work with each other. Very simple setup and configuration resulted in high adoption rates and the whole stack gaining more and more users. With Elasticsearch gaining in popularity, several hosted Elasticsearch services emerged on the market. Some of them, like Sematext Cloud, expose a subset of Elasticsearch API in addition to providing enterprise-grade features for users, like security, alerting and anomaly detection, reporting and so on. With increasing adoption came increasing demands for features. People started asking for out of the box security, user management, fine-grained data access control, alerting. Elasticsearch creators listened and built the most requested features and plugins available as commercial extensions. Because commercial plugins involved expensive licenses, some of the mentioned features were also developed as add-ons by third-party developers. For example, Yelp released and maintains Elastalert, an open-sourced and free alerting system based on Elasticsearch while security-related features can be added to the stack by using Search Guard available in a free and commercial version. You can read more about free alternatives in X-Pack alternatives post. While various individuals from the community already expressed their views on the move done by Amazon we decided to not do that. We could talk about how that move might affect Elastic, the user community, whether it would be good or bad, etc. Instead, we thought it would be more valuable for Elasticsearch users to know what they could expect from the Open Distro for Elasticsearch and how to work with it. So let’s dive in! 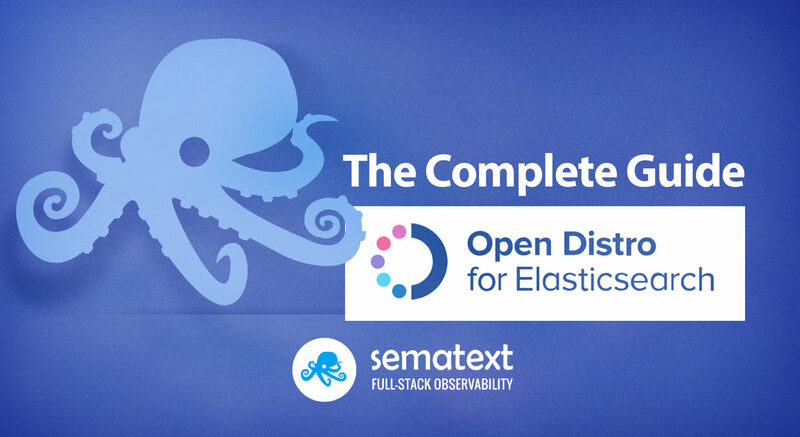 Let’s see how Open Distribution for Elasticsearch compares with various other Elasticsearch distributions and the features available out of the box. Keep in mind that this post is dedicated to the Open Distro for Elasticsearch and was not written to be a fully featured comparison between products coming from Elastic and distribution released by Amazon. We were interested in what is available as an open source Apache 2.0 licensed distributions and how it compares to the commercial products. There are multiple versions of Elastic Stack available for download from Elastic – starting from the open sourced, Apache 2.0 licensed one, through Basic – one that is free, but covered by Elastic license, ending on paid ones. Please note that some of the features mentioned in the Elastic Stack Features column are available as free extensions in the Elastic Stack Basic – those are marked with *. As you can see from the above table each version supports the core functionality of Elasticsearch search and analytics engine – indexing data, searching data and finally the analysis of the indexed data using aggregations. We’ll compare several free distributions of Elasticsearch with Elastic Stack Features which contain commercial extensions. There is also a commercial version of Search Guard that we cover in the X-Pack alternatives blog post, so take a look to have a more in-depth comparison. Encryption – one of the key features when it comes to keeping your data at bay is provided by every distribution apart from the main Apache 2.0 licensed Elasticsearch. Open Disto for Elasticsearch, Search Guard and Elastic Stack Features provide SSL for a node to node encryption, support encryption at REST and have a client to node SSL support. This makes it hard or impossible to intercept communication over the network and that way get a hold of your data. The same is true for authentication – you get out of the box support for it in the mentioned distributions. When it comes to data access control, granularity down to field level is supported only by Elastic Stack Features and Open Distro for Elasticsearch from Amazon. What’s more, the mentioned duo can be integrated with LDAP, Active Directory, Kerberos and SAML, thus providing enterprises with highly demanded features, especially for large organizations. Graph traversal and machine learning based functionalities are at the moment only supported by the Elastic Stack Features meaning that if you require them for your operations and business you need to go for a commercial license with Elastic. The same with Kibana Canvas support, which is not present in Open Distro for Elasticsearch or any other Elasticsearch distribution. Keep in mind that graph support can be added to all the distributions by using third-party plugins as we’ve mentioned in our X-Pack alternatives blog post. On the other hand, if you need your SQL based BI tool to be integrated with data in Elasticsearch you can freely use the two most feature-rich distributions of Elasticsearch – the one from Elastic and the one from Amazon. Real-time performance analysis – this is where things get interesting. You have two options here, or actually even more, but one thing at the time. Elastic Stack Features includes monitoring part, which can be used for real-time performance analysis as well. It is based on the metrics returned by Elasticsearch, so if something is happening with the JVM on which Elasticsearch is running you may not be able to get the metrics. In addition to that, keeping metrics data in the same cluster as your business data is usually not a good idea and you should have two clusters, just in case you need to troubleshoot. The Open Distro comes with the PerfTop tool, which is not bound to the same JVM and is exposed on a separate port allowing you to see real-time performance data. However, keep in mind that you won’t be able to see the historic view with Open Distro. Because of that and a number of other reasons, it’s a good idea to ship monitoring data out and use tools like Sematext Cloud to monitor Elasticsearch and your other infrastructure. Remember – you can’t fix what you can’t measure! The Open Distro for Elasticsearch is available as an RPM or as a Docker container. What’s more, because of out of the box security there are some things that are different, but let’s keep it simple and discuss one thing at a time. As in the above case, you may see warnings related to permissions of certificate files. This is OK for development but should be taken care of before running Open Distro for Elasticsearch in the production environment. This is important and you shouldn’t forget about that. The second port – 9600 is a new port when it comes to Elasticsearch. It exposes the metrics API that comes with Amazon distribution and is needed for the PerfTop tool to work. We cover the capabilities of the PerfTop later in this blog post. Even for local development, we will need to adjust the configuration at a certain point. The good thing is that most of the operations needed by the developers can be done using the well-known Elasticsearch API. Thus, there are no problems with creating templates, adding aliases, creating indices and so on – all Elasticsearch APIs you normally use will work with Open Distro for Elasticsearch as well. The only thing you need to remember is to pass the user and password for each command. For the purpose of the test we’ll omit a certain number of configuration options so that the presented file is smaller but still works. We start the whole stack by running docker-compose up command in the directory with our newly created docker-compose.yml file. If you don’t have docker-compose setup and ready, please refer to https://docs.docker.com/compose/install/ for installation details for your operating system. Also, please in mind that you need at least 4GB of memory to run the above example with docker compose. You will also be required to set the vm.max_map_count to a value higher than the default, e.g. to 262144. Once everything is started, you can go to localhost:5601 to see your secured Kibana interface. You can log in with admin/admin credentials. When you install and run the Open Distro for Elasticsearch from Amazon, both the Elasticsearch and provided Kibana you get out of the box alerting functionality. You can configure and run alerts against data that is indexed inside your cluster. There is a set of features available – we are allowed to define monitors based on queries and the charts built out of data, we can configure destinations like Slack channel, Chime, or custom webhook. We get a view of the alerts, we can acknowledge them, look into their details. The nice thing about Alerting functionality is that it doesn’t require additional software, cron jobs, etc.. Everything is done internally so we only have to worry about the Open Distro for Elasticsearch being up and running. As you can see both query based monitor and chart based monitor setup can be performed. This allows both less and more experienced users to create alerts based on data, so for example users that do not know the Elasticsearch API are able to create alerts. For alerts to work we need to create triggers to which we can assign the earlier defined destinations and finally have full alerting working. To sum up – very nice functionality allowing us to define a set of alerts to monitor events that are of interest for us, have them in a single place, visualized and accessible for both experienced and novice users. In a larger team, the alerts can be acknowledged so that multiple people are not working on the same issue reported by the alert. On the other hand, we don’t have any kind of anomaly detection algorithms that would react automatically to changing environment, but maybe we will see machine learning based alerts with the later versions of the Open Distro for Elasticsearch. Please note that Alerting bundled into Open Distribution for Elasticsearch are not alerts for monitoring Elasticsearch cluster health and performance itself. For that, you will still want to use something like Sematext Alerts or some other alternative. One of the key pieces of functionality that are delivered with Open Distro for Elasticsearch by Amazon is security. Out of the box, you get secured Elasticsearch and Kibana with authentication and authorization support, encryption and so on. No more unsecured clusters that people can get into only if the Elasticsearch port is exposed to the internet. Of course, we need to set it up and configure it properly, but it is a huge difference between the wide open default in the free Elasticsearch from Elastic and the one published by Amazon in the Open Distro for Elasticsearch. Let’s start by looking at options for data encryption – both encryption of data at rest and encryption of data in transit. We already discussed some of those topics in our Elasticsearch security: Authentication, Encryption, Backup blog post, but this time we will look into what the Open Distro for Elasticsearch provides. Provide your key and partition and you’ll be good to go! This lets you set SSL certificate and the configuration related to SSL as well as the internal audit logging of Elasticsearch. It also configures the Snapshot/Restore API privileges and the security roles that are enabled by default giving us a full set of options on how we want the nodes and cluster itself to be secured and run. internal_elasticsearch – stores the data in the same Elasticsearch cluster. While this is simple, you probably don’t want to store sensitive audit log data on the same cluster that the audit log is for. external_elasticsearch – stores the data in an external Elasticsearch cluster, or even a hosted Elasticsearch service. Of course, everything is configurable and we can exclude categories, disable audit logging for REST API layer, choose for which indices the audit log should be written, which request should be ignored by the audit logging, which users should be ignored by the audit log and we can modify the default daily audit log index rollover policy. For the audit logs, we don’t have a dedicated section in the UI, but we have to remember that we are inside Kibana. We can easily slice and dice the data if it is inside Elasticsearch. So with some one-time effort, we can build dashboards that give us data that we need to look into. On top of all of that, we are allowed to use single sign-on using SAML. The Open Distro Security plugin implements the web browser SSO profile of the SAML 2.0 protocol. Keep in mind that this is not a general purpose single sign-on functionality. It is specifically designed for use in web browsers. It’s main goal is to support logging into Kibana interface. The first line specifies the authorization type. The next two lines add validation for SAML assertions. The last line is only needed if you want to support logout endpoint. To learn more about Elasticsearch Authentication and Authorization check out the official Open Distro for Elasticsearch security documentation. Data access control is the last aspect of Elasticsearch security we’ll cover in this post. Depending on our configuration, especially when not using LDAP or Active Directory, we can configure the list of users and user groups with access to our Elasticsearch environment. We do that by going to the Security tab in Kibana and its Internal User Database. There we can see users and manage them. By default, there are a few users created automatically for us, but be sure not to leave everything as defaults – you want to configure passwords for example, so that you don’t have the false sense of security. Here we can configure that for the given index a certain query will be used to limit documents that the user with the assigned role is allowed to see. Like in the above example, a user with that role would only see documents matching the warning severity. The crucial thing here is that the query approach to security does not require us to re-index the data. It only requires a proper Elasticsearch DSL based query. The official documentation includes the full list of defined permissions. One of the features that business people may like is the out of the box SQL support and JDBC driver. That means that you can integrate your Elasticsearch instance with your favorite Business Intelligence tool and have your data visible in the same way. You should be aware of the limitations – e.g. the ones that we mention in the Joins Support section of this blog post. What’s more, there are already plugins for Elasticsearch that enrich it with SQL support – e.g. https://github.com/NLPchina/elasticsearch-sql. We will not be focusing on other plugins though and will instead look at how to run SQL queries against Elasticsearch from the Open Distro. "query": "SELECT * FROM test LIMIT 1"
The list of supported operations is quite extensive. From SELECT, DELETE through WHERE, ORDER BY, GROUP BY, LIMIT and so on. We can add conditions to our queries using, for example, LIKE, AND, COUNT, IN, we can run aggregations like avg, count, max, min, sum or include and exclude fields. Finally, run functions like floor, trim, substring and so on, but keep in mind that they may require fielddata to be turned on to properly work. The full list of operations that are supported is available in official Elasticsearch SQL docs. Even though Elasticsearch in the Open Distro from Amazon supports inner joins, left outer joins, and cross join, there are a number of limitations you should be aware of. First of all you can’t join data from more than two indices in a single query and you are obliged to use aliases for index names – otherwise, your queries will not work. You can’t use GROUP BY or ORDER BY statements for results. LIMIT and OFFSET are also not supported. Finally, within an SQL ON clause only boolean operator AND is supported. As you may have guessed, SQL support in Open Distro for Elasticsearch means that in addition to being able to run the SQL queries against Elasticsearch we also got the JDBC driver which allows us to use Elasticsearch as a data provider in any tool that uses the JDBC bridge to connect to databases. The JDBC driver can be found on Github (https://github.com/opendistro-for-elasticsearch/sql-jdbc) with full documentation on how to use it. At the time when this post was published the JDBC driver was not yet available in public Maven/Gradle repositories so the only way to have it working is by cloning the Github repository and building it on your own. Luckily, Amazon promises that they will publish the compiled version of the JAR to the public repositories, hopefully soon. The performance analysis part of the Open Distro for Elasticsearch comes with a new metrics endpoint and a command line tool. It includes various performance metrics for the cluster, nodes, etc. These metrics are independent of the Java Virtual Machine itself, so unlike the standard Elasticsearch metrics APIs, these metrics should be available even when Elasticsearch struggles to provide a response to the normal management REST API calls. Keep in mind the PerfTop, at least in the initial release, comes with executables for two operating system families – Linux and MacOS. This is handy for taking a quick real-time look at Elasticsearch health and metrics at the cluster and node level. For a full monitoring solution with metrics, alerts and logs all together with access to historical data for comparison and fine-grained analysis have a look at Sematext Cloud and its Elasticsearch monitoring integration. You may also be interested in our Performance Monitoring Essentials – Elasticsearch Edition ebook. In terms of features and cost, Open Distribution for Elasticsearch from Amazon seems like an obvious winner. It’s got nearly all enterprise-grade functionality, it’s open-sourced under a permissive Apache 2.0 license, companies like Sematext provide consulting and support for it, what else could one desire? Well, adoption. It is too early to tell whether the user and development communities will fully embrace it. It is adoption by these two communities that will determine the faith of Open Distribution for Elasticsearch. Another big question the community has is how much this distro will lag behind the version from Elastic and whether, in fact, Amazon’s distro will actually end up being a fork of Elasticsearch or not. On a more technical level, we don’t yet know what upgrades will look like, how much effort might be involved in swapping distributions, etc. One thing is certain though – we’ll definitely be keeping an eye on Open Distribution for Elasticsearch from Amazon. Have you managed to install any custom Kibana plugin (from here https://www.elastic.co/guide/en/kibana/current/known-plugins.html) on top of Kiaban OD4ES ? I actually didn’t try installing plugins, but I would suggest going to the Open Distro forums and ask there. The devs should be able to help if there are any issues around that. Considering we hear news about Elasticsearch deployments leaking sensitive user info all the time I wonder if OD4ES has a better/tighter OOTB security than free Elasticsearch? Keep in mind that those are paths for Docker, so if you are using RPM it may vary.